Gain Powerful insight into the most constructive and cost-effective means of implementing and managing channel data into a business’ insight. Proper management of channel data is enough to make a sane man go mad. If you feel that managing channel data is driving you up the wall, take a look at this white paper for an insider’s perspective on how to eradicate this common conundrum in indirect sales. 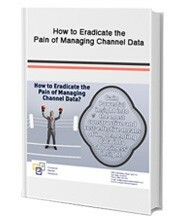 Receive a Free whitepaper on “How to Eradicate the Pain of Managing Channel Data” by filling out the form on the right.